A Montana civil rights advocate spoke during an event Friday at Montana State University-Northern celebrating the life and work of Martin Luther King Jr. about the progress, setbacks and continued struggle for racial equality. The event, which also included a meal for the community, was organized by Northern's Office of Diversity Awareness and Multicultural Programs and assorted community volunteers. 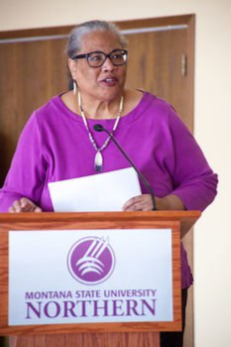 Judith Heilman, a former police detective who is now executive director of the Montana Racial Equity Project, a Bozeman-based group that seeks to promote racial equity and social justice, gave the presentation with the assistance of a PowerPoint. Heilman's 32-minute long presentation was titled "Racial Equity and Justice: Then, Now and Future." "We've made progress, and lots of progress in some ways, but some of those successes have been rolled back and are being taken away," she said. At the start of her presentation, she told the audience that some of what she had to say would cause discomfort, but that none of it should be interpreted as personal insults. "The cause of any discomfort is being confronted by something you may have had no idea about or have had a misunderstanding about," she said. It is widely believed that the civil rights movement ended with desegregation and the signing of civil rights legislation in the 1960s, Heilman said, but added that is not true. The issues of race and racism have remained in society, but just recently returned to the political forefront, she said. Heilman said that rather than marking the birth of a post-racial society, the campaign, election and presidency of Barack Obama as the nation's first black president "set what had been a smoldering fire of bigotry, racism and prejudice to flame." The notion of colorblindness, where people claim they don't see race has been something people say has been something in American society to be proud of, she said. However, she said, it should not be, and the idea of colorblindness is racist because in America white culture is the default, the dominant, culture. She said that to subscribe to the belief that black, brown, Native and other people are treated equally and have had the same experience as those who are white is not true. "Black folk have had a life experience and a cultural heritage that is very different than America's current majority do not have," she said. "Living in a black body, living in a brown body, living in a Native body is a completely different existence in many, many ways than living in a pale body." She said that the Black Lives Matter movement, formed in the wake of several police shootings of blacks, was meant to highlight racial tension. However, many who are not black have tried to spin the phrase from Black Lives Matter to All Lives Matter, something she said is meant to quiet and invalidate the concerns and views of the movement. Though all lives do matter, she said, the Black Lives Matter movement is about the recognition of the rights of black people and their battle for full social, civil, political, economic and legal equality with others. "Do people who change Black Lives Matter to All Lives Matter run to a cancer fundraiser and say 'There are other diseases too?'" she asked. Much of that pushback against the addressing of concerns brought up by the Black Lives Matter movement stems from white privilege, she said. Heilman said that when a group has been in the majority and accustomed to privilege for so long, demands for equality can sound like calls for oppression against the privileged. She quoted Martin Luther King Jr., who said that "Since we know that the system will not change the rules, we are going to have to change the system." Heilman said that notion is critical to working to end racism and gain racial equity and access. She said that up through 1968, lynchings of black men were fairly commonplace in the U.S. with as many as 84 taking place between 1882 and 1968. Though the practice is widely condemned today, she compared it with cases such as the 2015 shooting of Walter Scott. Scott, a black South Carolina motorist was shot by a police officer five times, three times in the back as he was running away from the officer after being stopped for a broken tail light. Heilman calls the incident "a modern-day lynching"
Though the shooting was captured on video, a mistrial was declared last month in the case due to a hung jury. The officer will be tried again. "How is that justified? And I am saying that as a retired detective sergeant," she said. She said that in 1963, four white men bombed a black church in Alabama which resulted in the death of four young girls who were attending Sunday school classes and wounded 17 others. Back then, FBI Director J. Edgar Hoover, a foe of the civil rights movement, hampered the investigation into the bombing, Heilman said. The case was not resolved until the early 2000s. She contrasted that case to a recent act of racial violence against a black church. Dylan Roof, a white man, opened fire on a group of African-Americans at the Emmanuel Baptist Church in Charleston, South Carolina, killing nine people. He was tried and later sentenced to death by a federal grand jury. Heilman said the state charges are still pending. The bodies and wounded victims of the 1963 bombing were not transported from the scene to the hospital or morgue until segregated ambulances could arrive, Heilman said. She compared that to the 2014 death of Michael Brown, an unarmed teenager who was shot to death by a police officer, which sparked protests in the city of Ferguson, Missouri. Heilman said the body of Brown was left on the street for four hours before the corner took it away. "The disregard and disrespect of black bodies continues even in death," she said. Heilman talked about how in 1965, 50 people were hospitalized in March after protesters were beaten by police during a demonstration for voting rights in Birmingham, Alabama. One of those injured protesters was then-young civil rights leader and future Rep. John Lewis, D-Ga,, whose skull was fractured in the incident by a blow from a police baton. Two years ago, in commemoration of the 50th anniversary of that incident, known as Bloody Sunday, Lewis, joined by President Obama, former President George W. Bush and many others walked across the bridge made famous in the 1965 march in a show of unity, Heilman said. However, she said, this unity is a distortion of reality. Despite the removal of Confederate flags from some state capitals as well as the statues of men once celebrated as Confederate heros, systemic racism still exists. "Systemic racism must end or ... the racism of daily life will continue to thrive," she said. There are several areas where gains in equity for African-Americans and desegregation seem to be being rolled back, she said. Though Brown vs. the Board of Education, the landmark case that ruled that legal segregation in schools was unconstitutional, the growing popularity of charter schools could increase segregation, Heilman said. She said charter schools in diverse cities tend to be more racially segregated than public schools and could lead for public schools to be more segregated than they otherwise would be. And despite the passage of the Voting Rights Act of 1965, the U.S. Supreme Court in recent years has struck down key provisions that protected the right to vote, she said. Heilman said state legislatures around the country have tried to pass stricter voting laws, such as the Montana Legislature's attempt to do away with early voting, all of which would adversely affect a range of groups including racial minorities. Negative depictions of African-Americans continue in the media, Heilman said. In her PowerPoint presentation, she juxtaposed a 1952 ad for dress shirts with an ad from what she described as the gun lobby. The ad from 1952 showed drawings of four white men dressed in the shirts and an African dressed in stereotypical tribal garb. She said the ad portrays African Americans as "uncivilized savages." The gun lobby ad shows the hand of an African American holding a gun in the foreground with a frightened white person in casual wear in the background. Heilman said that the gun lobby ad is a subtle scare tactic known as "dog whistle politics" that seeks to promote an us vs. them mentality. She said that the movement for racial equity has and needs support from whites who make up the current majority in America. To advance racial equity, she said, whites can do so by dropping their own frame of view and putting themselves in the shoes of another marginalized group. "Listen to what marginalized and disenfranchised people have to say. Listen to their experiences from their point of view living in a black or brown body 24/7, 365." Heilman said.